When William Backhouse Astor died in 1875 his more than $100 million estate was passed on to his two sons, William and John Jacob III. They continued to run the family’s real estate empire from the 1835 Greek Revival building at No. 81 Prince Street, just around the corner from Broadway. But five years later the brothers decided on a move uptown. They commissioned Astor architect of choice, Thomas Stent, to design a new Astor headquarters on West 26th Street, and an imposing commercial building to replace the old one. Where the Prince Street building had stood would rise a brick-and-stone structure that stretched along Broadway from No. 569 to 575 and filled the Prince Street block. Early in 1881 Sanitary and Heating Age announced that John Jacob Astor would build a six-story building with “tin roofs and iron cornices” and would have “steam heaters.” The projected cost was $350,000. Construction began on March 28, 1881 and was completed a year later, almost to the day, on March 29. The Broadway neighborhood had become one of expensive hotels (the Metropolitan Hotel was directly across the street and the white marble St. Nicholas Hotel was just two blocks to the south) and refined shopping. Stent’s handsome new building was just the ticket for a large retailer. Constructed of red brick with contrasting stone, it blended what has been called the Commercial Palace Style with Ruskinian touches like the splayed stone treatment above the second floor windows. While creating a harmonious whole, each story was treated differently in its shape and size of window openings, carved ornamentation and details—such as the polished granite colunettes at the fourth and fifth floors. A wonderful cast iron storefront with handsome Corinthian columns offered broad expanses of glass. 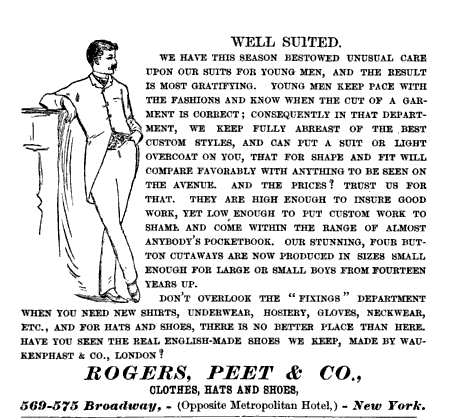 Six years earlier M. N. Rogers and Charles B. Peet had joined forces to open a men’s and boys’ clothing store on Broome Street, called Rogers, Peet & Co. At a time when ready-made clothing was considered lower class, the firm offered well-made goods at affordable, if not inexpensive, prices. But the store’s success depended as much on marketing as it did on its apparel. Rogers, Peet instructed its sales team on courtesy and service. By treating its customers as though they were wealthy patrons of a more exclusive store, the company guaranteed return business. While the clothing store took up the retail space, the upper floors of No. 575 Broadway filled with hat dealers as the dry goods and millinery district centered itself in the neighborhood. 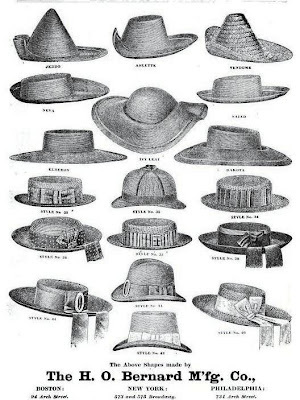 Other millinery concerns in the building were Hirsch & Park, makers of straw hats for ladies, misses and children; and H. O. Bernard Manufacturing Co. 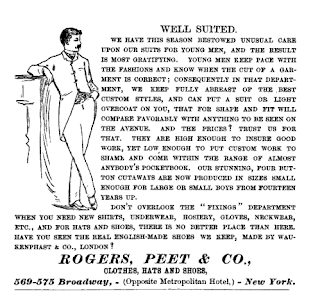 In 1902 Rogers, Peet & Co. moved to a new store further north on Broadway, ending two decades at the Prince Street and Broadway location. The building was sold by the estates of William Astor and John Jacob Astor on May 17, 1925. The vast spaces once filled with men’s shirts and boys’ knickers became home to the Lightolier Company, dealers in electric light fixtures. Through the middle of the 20th century the Broadway neighborhood suffered neglect, but resurged when the SoHo artist area took shape and the cast iron historic district was rediscovered. In 1996 No. 575 Broadway was remodeled by Arata Isozaki as the Guggenheim Soho museum. Perfido Weiskopf Wagstaff & Goettel executed the rehabilitation of the building, not only bringing it into the 20th century with new electrical and plumbing, but analyzing the layers of paint to discern the original 1882 colors. Prada commissioned Dutch architect Remment Lucal Koolhaas to renovate the space into what the AIA Guide to New York City calls “a whimsical wonderland.” The upper floors filled with the upscale magazine publishers of Art in America, Interview, and Antiques; and offices like those of Bobbi Brown Cosmetics. In January 2006 a devastating fire raged throughout five of the six floors. 200 firefighters fought the blaze for three hours before extinguishing it. Deputy Assistant Fire Chief Ronald R. Spadafora announced that most of the interior would have to be rebuilt; “but its brick façade escaped virtually unscathed,” said New York Times reporter Fernanda Santos. Today there is no hint of the fire. The striking brick-and-stone building is as handsome today as when Rogers, Peet & Co. sold its first shirt in 1882. Rogers Peet really brings back memories: When I was a child (mid 1960's) my school uniforms came from Rogers Peet and I remember the mid August visits there to be fitted for the requisite blazer. Where the store was at that point, I have not the foggiest. Another great post in one of the best columns in the blogosphere. That's almost intergalactic. wow. thanks for the REALLY generous compliment. Glad you enjoy the blog. During the mid-20th century there were several Rogers Peet stores in Manhattan--Warren Street, Union Square, 5th Avenue at 41st Street, 5th Avenue at 48th street. I loved your post and really appreciate the history of 569 Broadway. Do you have any information regarding the building that preceeded the 1880s building? My third great grandfather, John Prescot, was a watchmaker and his business was located at 569 Broadway from the mid 1860's until he died in 1880. He emigrated from Ireland in the 1850s or 1860s. When did the last Rogers Peet store close up shop (the only references I can find says "mid-1980s" ... and what finally drove them out of business when competitors like Brooks Bros are still thriving? ?